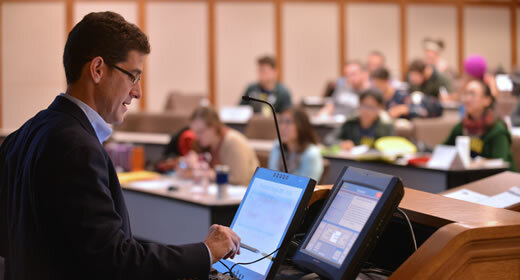 Brian Jacob, professor of economics, education and public policy at the University of Michigan, was awarded a $486,501 grant from the Alfred P. Sloan Foundation to study the relationship between behavioral nudges and intrinsic motivation. Jacob, co-director of the Education Policy Initiative at the Ford School of Public Policy, is joined on the project by Damon Jones and Benjamin Keyes, both assistant professors at the University of Chicago Harris School of Public Policy. The research project runs through July 2017 and includes a randomized controlled trial with 20,000 teachers in Michigan. The study will try to determine if particular "nudges" will influence whether teachers apply for the federal Teacher Loan Forgiveness program. Nudges work by altering the framing of a decision in a way that does not affect the primary economic costs and incentives, but may alter outcomes. Nudges have been employed to influence decisions on retirement savings, energy conservation and prescription drug choice. A common feature of these nudges is that a number of steps involved in making a decision are streamlined, automated or the ultimate decision itself is set to some default. "I have been fascinated with the power of small 'nudges' to generate large behavioral changes for some time," Jacob said. "The case of getting teachers to apply for federal loan forgiveness programs—which might encourage them to remain in high-needs schools—seemed like a perfect context to learn more about such nudges." The loan forgiveness program provides student loan debt relief of either $5,000 or $17,500 to eligible teachers. To qualify, teachers must teach five consecutive years in a qualifying school or schools, which are defined by having more than 30 percent of students receiving free or reduced lunch. "Given the amount of loan forgiveness available to many teachers, they should clearly apply for the program. However, as in many other social policy areas, there are formidable barriers in terms of gathering the necessary information and navigating the application process," Jacob said. "I am eager to see whether various nudges will help persuade more teachers to apply for federal loan forgiveness." For more information, contact Greta Guest, Michigan News, at 734-936-7821 or gguest@umich.edu. U-M has a satellite uplink TV studio and an ISDN radio line for interviews.